The SmartNode 100 series are cost effective, feature-rich ATAs that connect one or two standard telephones or fax machines to a computer/network to make VoIP calls using your broadband connection. There’s no need to replace your existing analog telephones just because you want to enhance your phone system! The SmartNode 100 series of ATAs are feature-rich analog telephone adapters that enable you to connect standard telephones and make VoIP calls using your broadband connection. There is no need to replace your existing analog telephones just because you want to enhance your phone system. Easy to install and simple to use, the SN100 series connects standard telephones or fax machines to any Voice over IP (VoIP) service provider. 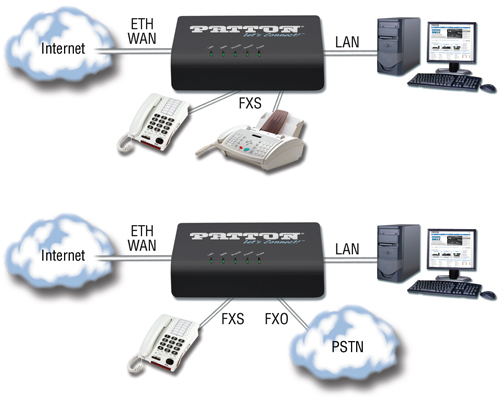 Well equipped with two FXS RJ-11 phone interface, you can speak or fax as with the old fix net telephone. With small design you can easily place the adapter anywhere.